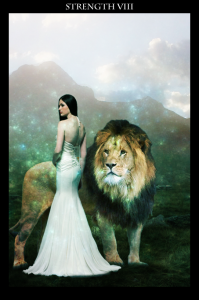 July 22 – August 22 falls under the sign of Leo and the Tarot card of Strength (Major Arcana, #8)*. Leo is Greek for lion, and it is the animal that often represents strength and royalty (fortitude and confidence). Think about it. Lions can be found everywhere: in the coats of arms for European families, sewn into the silken robes of an Asian emperor, representing the Lion of Judah for the Rastafari. Statues of lions sit or stand guard at many an entrance, and they can be found on currency such as the South African rand. You must be strong to be “king of the jungle”. The card of Strength doesn’t necessarily represent physical strength though; it is also quite (most?) effective on a mental and emotional level. The number 8 card represents fortitude and endurance required to tame the lion and the ferocity within the self. It’s a strength found in being compassionate and good to others through empathy and understanding. Being a fire sign, it would be easy to resort to the force of a whip and chair to tame the lion, but it takes true fearlessness to put those tools down, getting what you want through love, patience, confidence, and even self-acceptance. The time of Leo/Strength can test our patience. If you don’t feel confident on your path, then it may be time to change that. Strength is having the courage to make difficult choices in pursuit of health and happiness. It is also the endurance and tenacity to get what you want in life without harming others. In the jungle, only the strong survive, but as animals of conscience, we also know there is strength in compassion. During this period (July 22 – August 22), there will be an opportunity to master the instinct. Intellect is good, but it is doubled in strength when it works with instinct. Take this time to mediate and integrate those energies; power cooperating with awareness. You will have the tools to accomplish this with the energy of stamina and tolerance more available to you. Strength is acting on the knowledge that you get more bees with honey than vinegar. Those born under Strength often have (or are forced to learn) the ability to overcome difficult situations with love and patience rather than force. You are able to face challenges and setbacks with the courage of a lion. Temper your might with gentleness and consideration and have the humble confidence that you can succeed. You will probably have to learn to “tame the beast within”. Passion and instinct can easily turn into irrational impulsiveness. You may have to overcome your own fears and temper to recognize you can get your way more easily through love and patience. Passions may need to be tempered, judgments and expectations released, for reconciliation. You may find yourself (often) apologizing for lashing out at loved ones. Famous Leo: Amelia Earhart, Carl Gustav Jung, Aldous Huxley, Stanley Kubrick Mick Jagger, Charlize Theron, Martin Sheen, Barack Obama; James Cameron, Robert De Niro; Roman Polanski, Christian Slater, Wilt Chamberlain, Coco Chanel, Jackie Kennedy Onassis. 8 tarot, astrology, Personalities of the Tarot, strength, tarot. Bookmark. Thank you, Elizabeth, for honoring my sign with your insights!